Southeast Alaska will open to commercial fishing for red king crab this fall for the first time in six years. The crab population has seen a steady increase, according to state surveys. Red king crab are the largest shell fish in the state and can weigh up to 24 pounds and have a leg span of five feet. What commercial fishermen in Southeast haul in is smaller, usually around eight to nine pounds but they are still worth a lot. 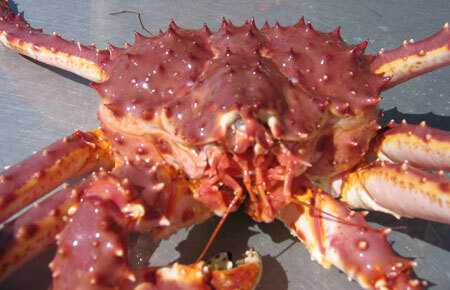 Red king crab brought nearly $11 a pound during the last opening in 2011. So, it’s not unheard of to bring in a hundred-dollar crab. The last fishery was worth nearly $1.9 million at the dock. But whether the opening set for November 1 will be lucrative is still to be seen. Joe Stratman is Alaska Department of Fish and Game’s lead crab biologist for Southeast. He said the red crab population has been on the rise since 2013. Fish and Game monitors the population through annual surveys where they catch and sample crab. They also work with local fishermen on a mark and recapture project. They track two groups of king crab: the legal biomass or crab that are big enough to be harvested in the commercial fishery. And the mature biomass, which also includes crab that are sexually mature but not big enough to be landed. Stratman said both numbers look good this year. “These adjusted biomass estimates amount to a 40 percent increase in the legal male biomass and the 41 percent increase in mature male biomass from last season,” he said. Stratman said that’s the largest increase in a few decades. The state can open Southeast’s commercial season if the estimated amount of legal size, male king crab tops a harvestable surplus of at least 200,000 pounds. This year, it’s just above that. Managers will be keeping close tabs on the fishery. They are splitting the region into six fishable areas. They will open for only 24 hours, then close for four days for sampling. Then two areas will reopen for a length of time that will be decided later by managers. 59 fishermen in Southeast have permits to participate in the fishery. KFSK contacted some of them in Petersburg. Nick Versteeg, a life long fishermen, said the opening is short but it’s better than nothing. Craig Evens, who has been fishing in Petersburg for 40 years, said he was confused by the announcement. He said he’s not sure how it’s going to work with a 24 hour opening, then a closure and then a reopening. Still, he said he’s glad there is at least some kind of opportunity. Several other fishermen say they aren’t happy with the opening but didn’t want to be interviewed. The population of Southeast’s red king crab has been in flux, according to Fish and Game. Back in the 1990s and early 2000s there were commercial openings nearly every year. But then there was a decline for about 12 years. The population was dropping about seven percent annually and then it started to rebound. Stratman said they aren’t sure why the population has changed. This fall’s commercial opening will allow fishing in more Southern, non-traditional areas than in previous fisheries. Stratman said managers have created Northern and Southern non-surveyed areas, with two separate harvest levels. “Based on what we’ve heard from the fleet, I think splitting it up this way, I think it will allow for the time that they’re looking for,” Stratman said. Fishermen can also take blue king crab in the fishery. But they are incidental catches representing only about one percent of the king crab population in Southeast. The increased population of red crab is also allowing more liberalized bag limits for the personal use fishery outside of the Juneau area. Starting in November, the bag limit will increase from one crab a day to three or six depending on the location. But red king crab aren’t easy to get. They prefer deeper water starting around 150 feet. Fish and Game managers are asking that fishermen comply with call-in rules during the fishery so they can track the harvest and coordinate port sampling.